If the Automatically create and associate companies and contacts setting is enabled, HubSpot will attempt to match the contact email domain name with a company domain name to associate the two. However, you can also manually associate a contact with a company from either the contact record or the company record. Please note: it is not possible to associate a single contact with multiple companies. When viewing a contact that is already associated with a company, the option to associate that contact with another company will not appear. Associating a contact with a company from the company's record will disassociate the contact from any previously selected companies. Click the name of the contact to associate with a company. In the right panel, Company section, click Add a company. In the dialog box, search for the company by name or domain name. If the company doesn't exist in your account, click the Create a company button to create a new company record. Click Select next to the company to add it to the contact record as an associated company. Please note: you cannot associate a contact with multiple companies. 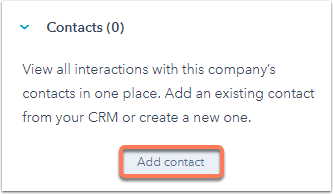 In your HubSpot account, navigate to Contacts > Companies. Click the name of the company. 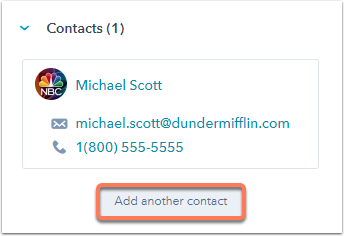 In the right panel, Contacts section, click Add contact, or if you've existing contacts already associated to the company, click Add another contact. In the dialog box, search for the contact by name or email address and select the checkbox(es) next to the contact(s) to associate to this company. If the contact you're searching for does not exists, click Create a new contact.